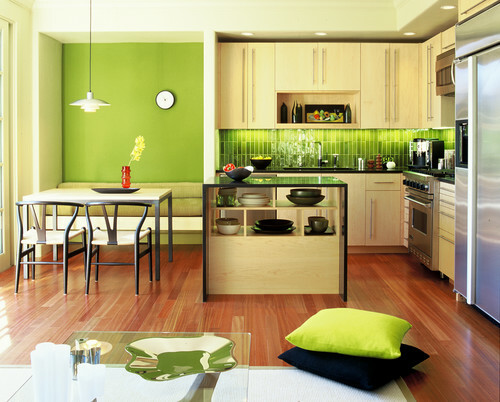 In honor of St. Patrick’s Day, let’s focus on painting a room green. Green walls can be notoriously hard to get right, even if you are Irish. 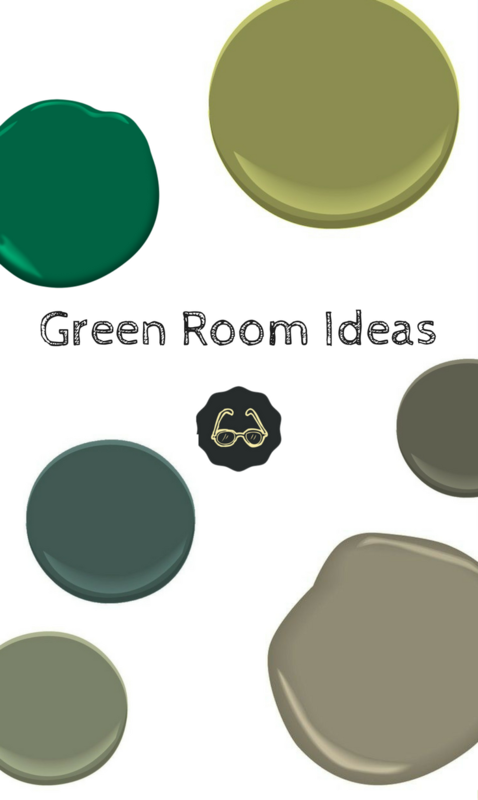 So start your DIY painting journey off with some killer green room ideas. Chartreuse? Emerald? Forest green? Apple green? Lime? Moss green? Let’s see what the rest of the world is doing with green. 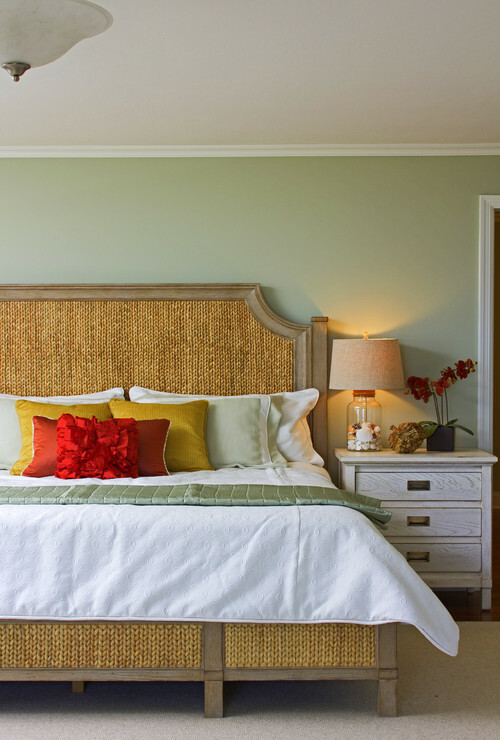 This room is Benjamin Moore Guilford Green. Walls areFarrow and Ball Ball Green. The trim is Ben Moore Navajo White. The walls in this living room are Fernwood Green 2145-40 by Benjamin Moore. 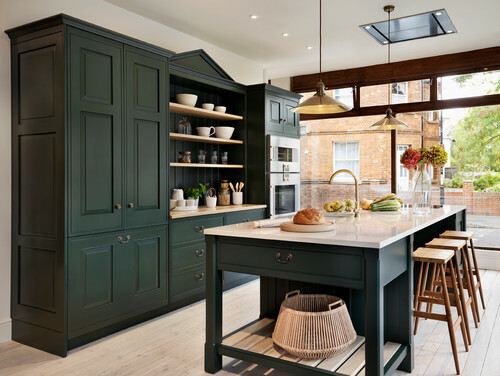 The cabinet color in this fantastic kitchen is Farrow and Ball Studio Green. 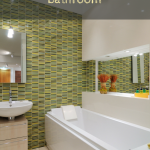 You don’t always need to paint your bathroom green. 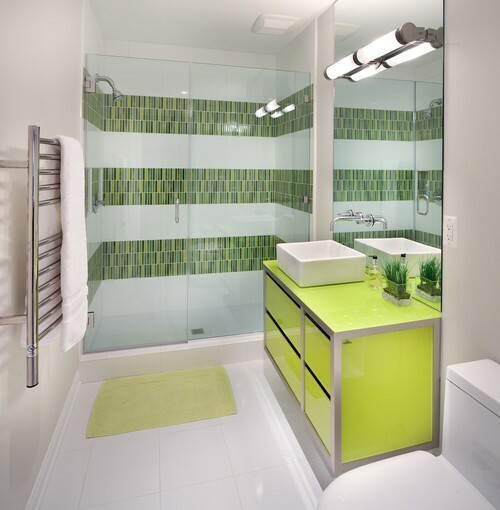 This Porcelainosa Vanity provides the green accent. Leave the walls a neutral color and let the finishes do all the talking. 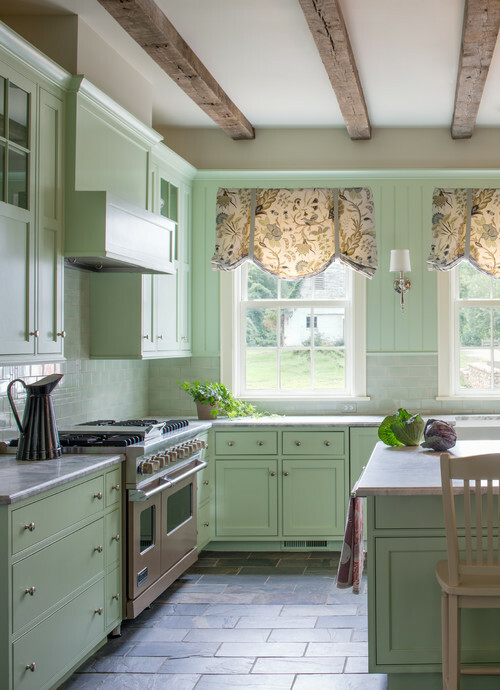 The shade of green on these cabinets is a custom wash finish and color. 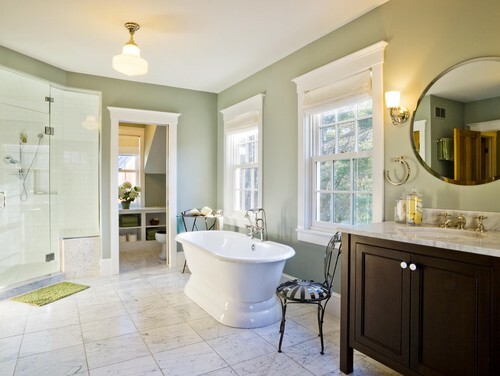 Walls in this bathroom are Benjamin Moore Aganthus Green. 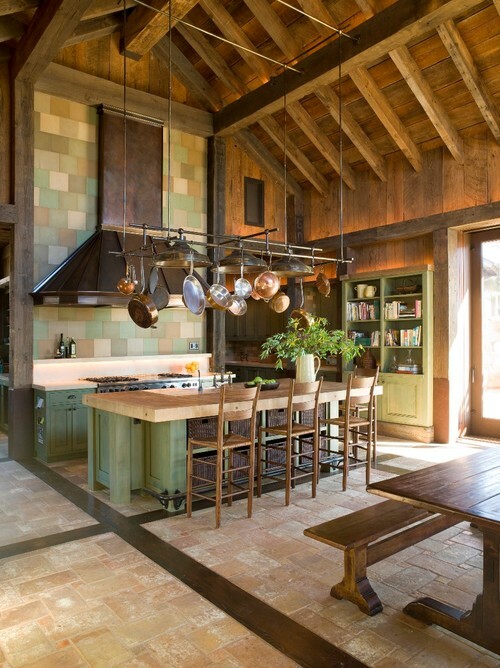 The designer of this kithcen mixed three colors together to get that perfect shade for the cabinets. 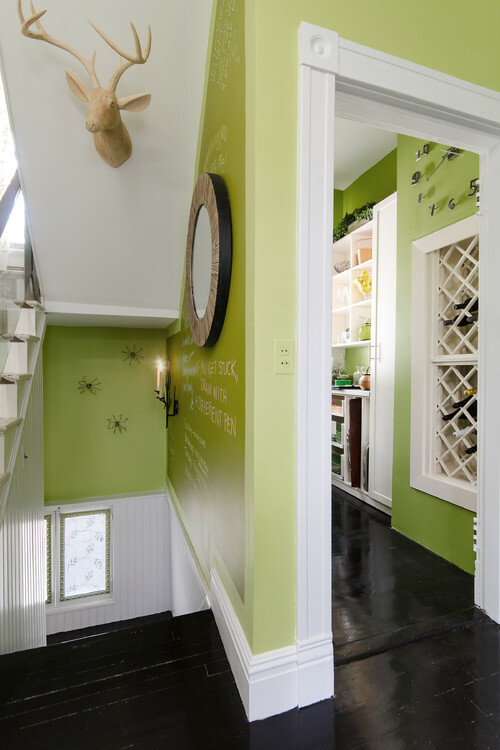 There are three colors in the following picture: Base of the stairwell is Ben Moore Pear Green, the wall on the right of steps is Hudson Chalk Board Paint “bakery green”, and the room on the right is Ben Moore Perrenial Green. This kitchen uses Benjamin Moore Mustard Olive #2151-10 in a flat finish. 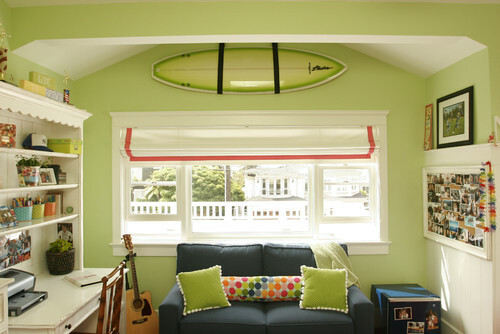 Benjamin Moore Wales Green would be a close match to this attic room. 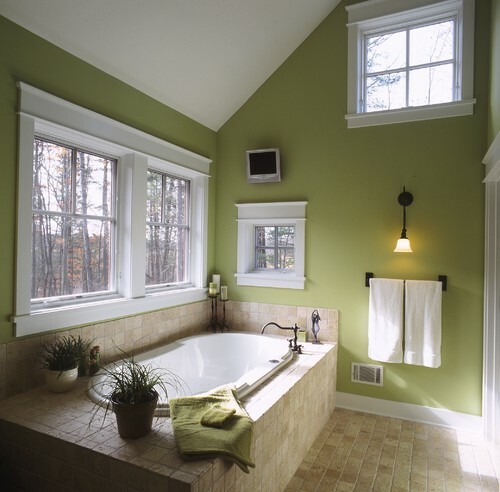 Bathroom walls are Sherwin-Williams SW6424 Tansy Green. The Green Siding is Sherwin Williams Sage Green Light- SW2851. 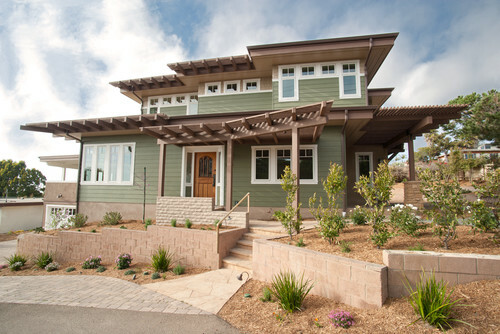 The Trellis and Fascia is Sherwin Williams Rookwood Medium Brown SW2807. The Window Trim is Sherwin Williams Classical White SW 2829. The Shingle Siding on Top is Sherwin Williams Colonial Revival. Another custom mixed color in the back of these bookshelves. 🙂 Wish I could walk into Home Depot and buy it. Inspired by this post? 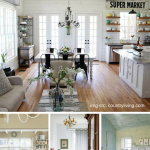 Follow SquareFrank on Pinterest and see all of our paint color ideas! I'm Joss from SquareFrank. We are Design & Data & Decor. We talk about houses, web design, and collecting data (forms & automation). Yep, not the usual combo.